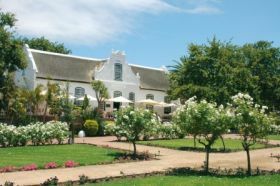 An easy drive from Cape Town, the Winelands dramatic mountains stand guard over a quilt of working vineyards, elegant Cape Dutch estates and quaint towns boasting top restaurants, hotels and spas. The Winelands is all about stepping back from the hectic pace of modern living, and appreciating the finer things in life in some of the most gorgeous and tranquil locations South Africa has to offer. Sample some of the regions award-winning wine offerings, stroll through exquisitely maintained gardens or explore art galleries and antique shops in the oak-lined streets of the local towns, you will never want to leave. Base yourself in the lively university town of Stellenbosch, with its galleries, shops and cafés surrounded by around 200 wineries or beautiful Franschhoek, a charming town with French Hugenot heritage and arguably the culinary headquarters of the country. Framed by a majestic backdrop of the Helderberg Mountains, Paarl lies peacefully nestled amongst vineyards laden with the harvest’s finest offerings.